I LOVE lipsticks. If not for some self-control and discipline, I would own 200 by now. Even though I have lip allergies and my lips are extremely dry and flaky, I don’t give up! I keep trying to find those perfect lipsticks. I am also a fuss-free person – I do not own or apply primers and other kinds of bases. Hence, the lipsticks I choose to wear must be pigmented enough (and yet moist) to take care of my dark (and dry) lips. I usually go for pinks, corals and nudes and I wear them in every season but the following are really apt for Spring / Summer and suit my warm olive Indian skin perfectly. The perfect beige-pink. This is a warm shade of pink, which is rare to find. Most light pink shades have a blue tinge. This one has a tinge of peach in it. 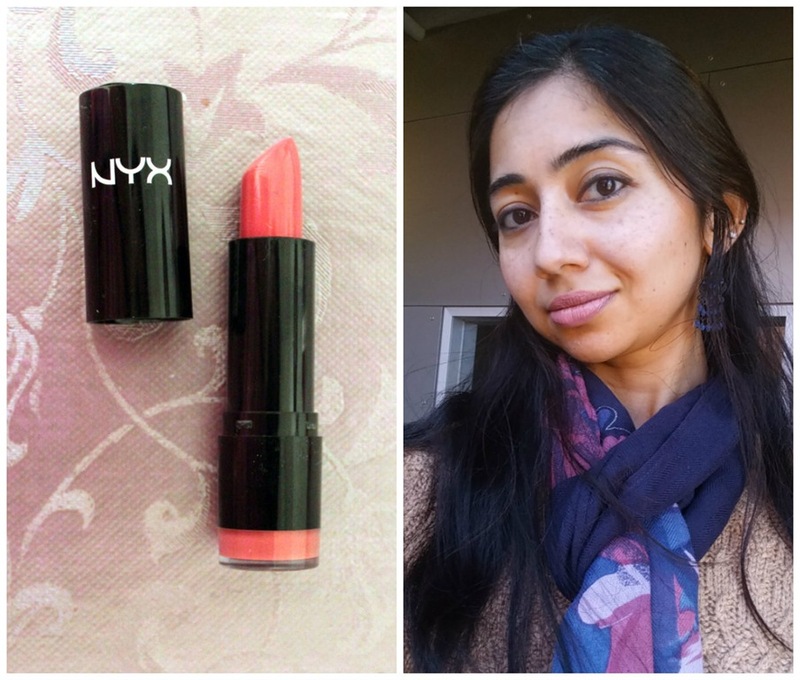 Nyx Round lipsticks are extremely creamy and soft. They glide really well on dry lips and moisturize. The span of their range and price is amazing too. The perfect coral! I must have bought (and returned) so many lipsticks because I wouldn’t find the perfect coral. Well, this is it. The search is over. 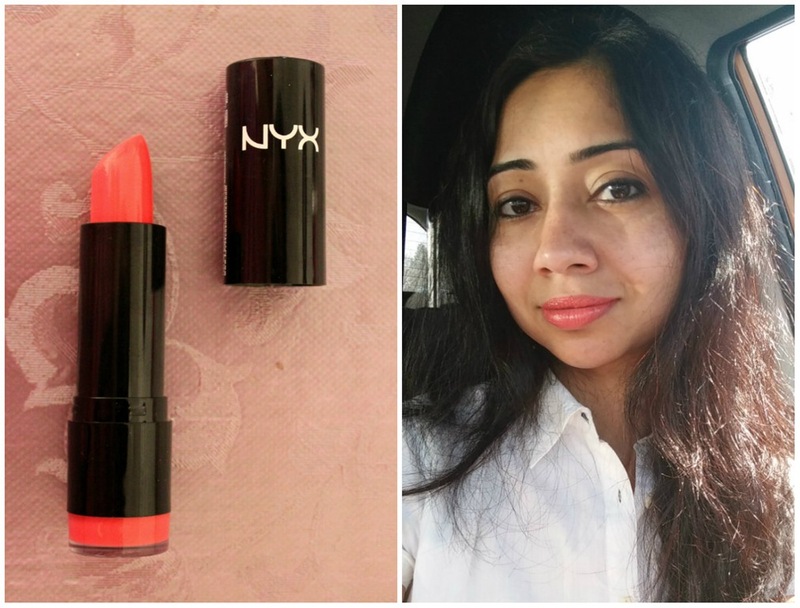 This shade is a perfect mix of coral and pink. It is not lopsided towards tangerine or bubble-gum pink. Will suit fair skin equally well. The perfect neon pink. This was my first Mac lipstick. It is a real pretty pink. Sometimes appears neon and sometimes, soft pink. It looks good even when I get tanned in Summer. I like to apply decent amount of lip balm before I use this because by the end of the day, my lips get dry and start burning. I often take it off before I leave work and apply lip balm to soothe. But the shade is so pretty! The perfect neon orange. 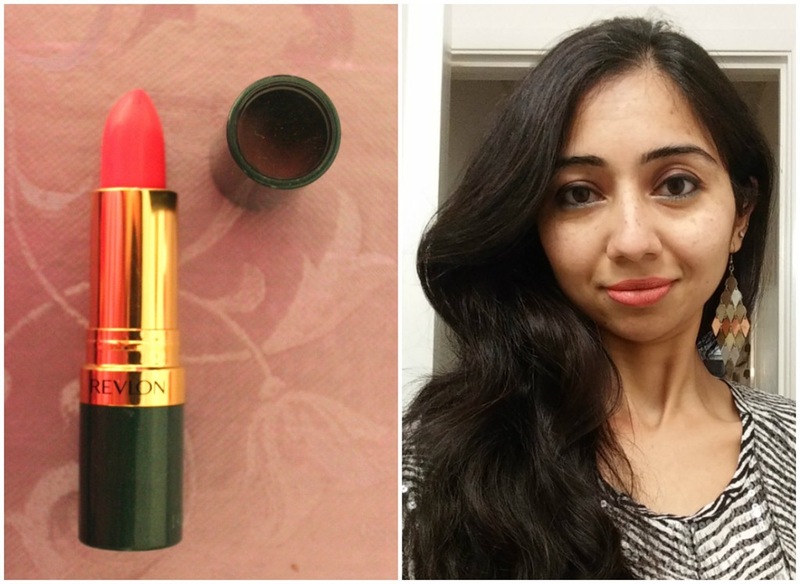 This lipstick is a traffic stopper! It is really bright, opaque orange with no tinge of red or pink. In indoor or low light, it shows hints of pink but in daylight, it is quite neon-ish. It is a bold color but because orange generally looks good on brown skin, it looks great. Great texture and price, too. The perfect snowy pink. 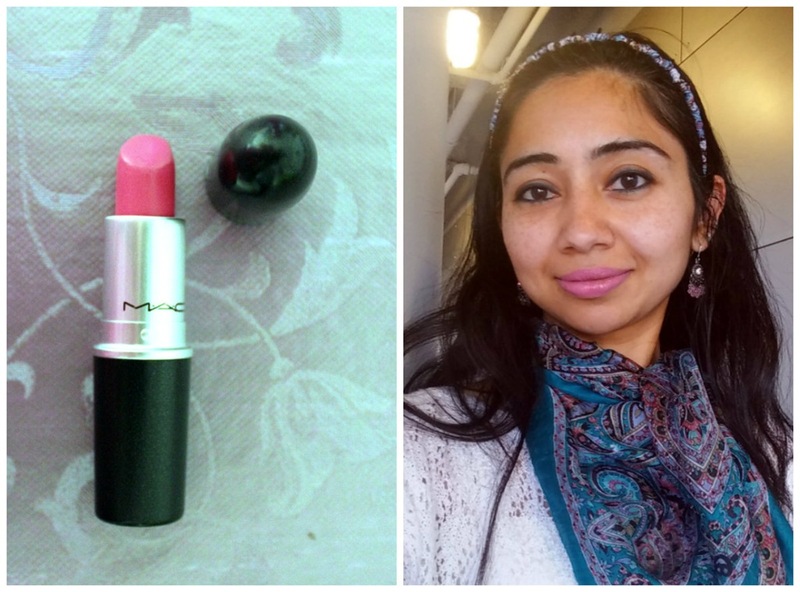 It is hard to find a light pink shade that will look good on warm medium tones skin. Well, here it is! Also, I find that Maybelline lipsticks are best for my dry lips. They are extremely moisturizing without going and settling into the crease lines. They actually feel as light as balm. The perfect peach. Again, a very hard-to-find shade. It is definitely challenging to make the color peach look good on medium skin. This one does! 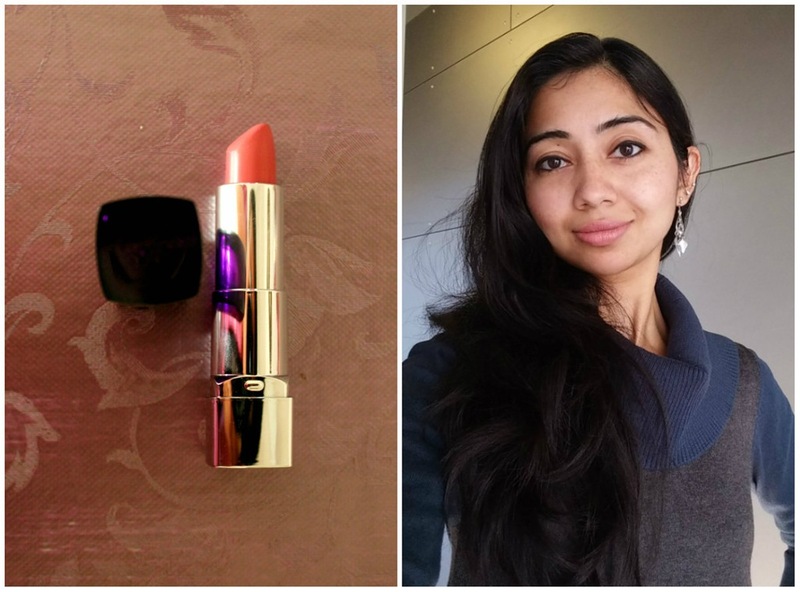 Rimmel lipsticks are soft and creamy. They have a strong fragrance but that’s a small thing compared to their great quality, variety of shades and wonderful pricing. I own 3 Rimmel lipsticks and am very happy with them. The perfect neon fuchsia. 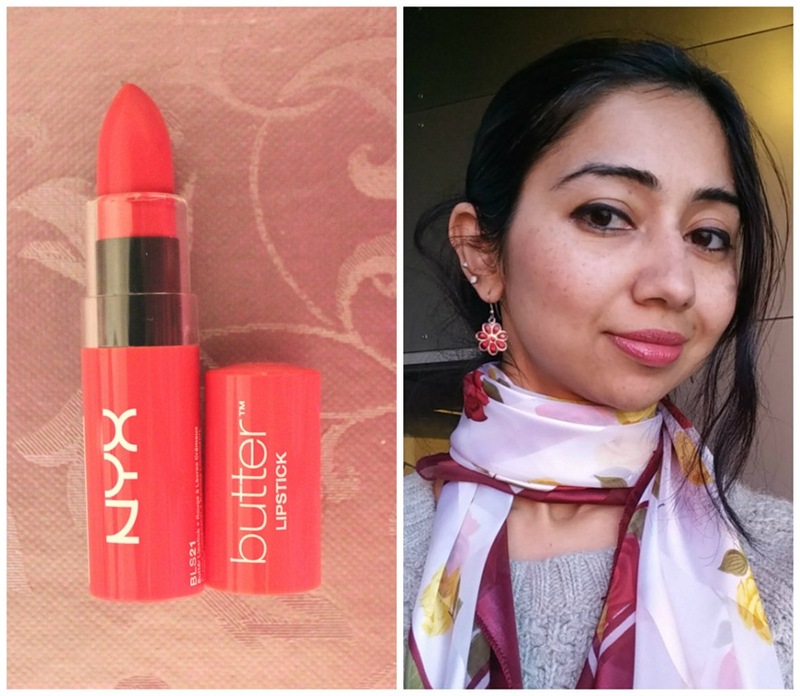 After I used this lipstick (bought it only a couple of weeks ago), I became a fan of Nyx (if I wasn’t already). This lipstick really feels like butter. It glides smoothly and keeps my lips well moisturized. It is very pigmented and has great staying power. What’s not to love?! I would buy more of their shades. If only CVS had the entire range, not just 6-7 selected ones! The perfect tangerine. By now I know that I like orange more than red as a lipstick shade. This one by Chambor (costed me a bomb back then) comes with a Jojoba centre. Probably, that’s why the texture is so light and moisturizing, not to mention, long-stay and highly pigmented. Being a lovely tangerine color, it is perfect for warm skin tones. 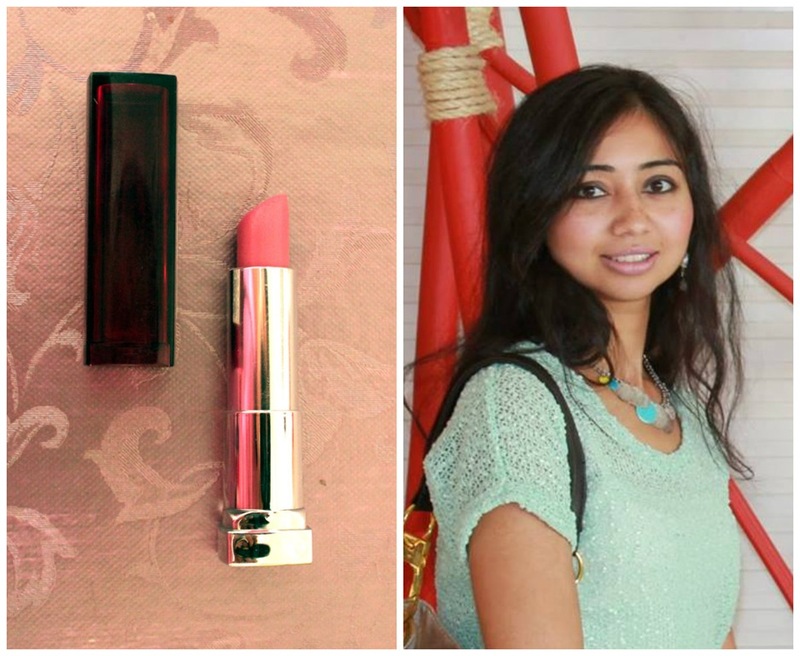 It gives you a bold lip, yet blends well with the skin shade. so, here was my 2-cents. Do share yours! 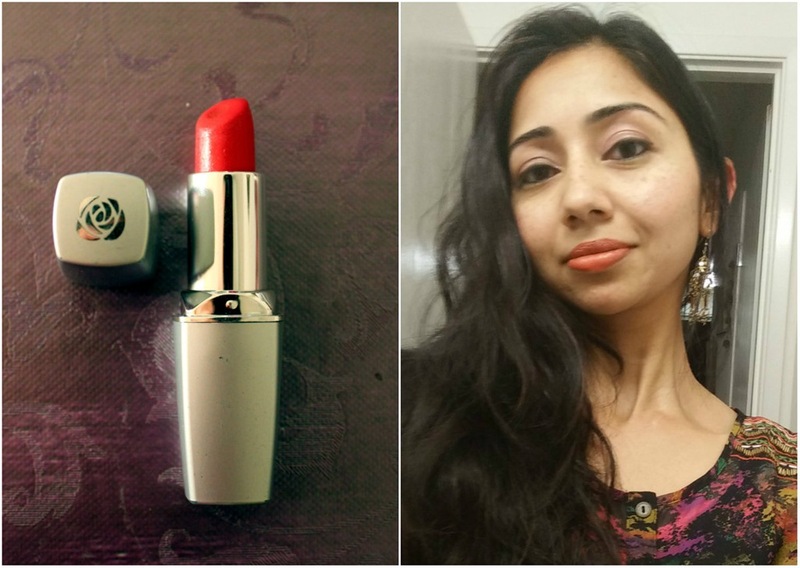 This entry was posted in Beauty / Makeup and tagged chambor lipstick, lipsticks for indian skin, lipsticks for warm olive skin, mac chatterbox, makeup tips, nyx butter lipstick fizzies, nyx haute melon, nyx tea rose on March 13, 2015 by NS. Hey there 🙂 I picked you for an award! Check out my post. Your style and taste is so effortlessly chic! You’re definitely my new favourite blogger. Will be following your blog for sure x.